For I had come back, and I dreamed once more, in the cool air of the Highlands. And the voice in my dream still echoed through ears and heart, repeated with the sound of Brianna’s sleeping breath. There were many situations that had me slowing down, re-reading, and actually researching online to put two and two together. This stuff really happened (well, maybe not the time travelling part, but the rest of it)! Jacobites, kings, plans to overtake thrones, rebellions and traitors. And on top of all that, it seemed anyone who’s a Royal, is somehow related in one way or another (and out to get each other, too). How to keep it all straight? I’ll admit, I’m not a history buff, and especially not when it comes to the issues that happened in other countries in the 1700’s. That was like…forever ago, and I mean come on!? Did anybody really exist in those times? Tee hee *joke*. I know, I know, that’s a completely ridiculous notion, but for real, ya’ll. That was a heck of a long time ago, and like I mentioned previously, “historical romances” did not intrigue me in the least. But guess what? Since reading these (and other) “Highlander” stories, I’ve become a bit obsessed. It’s freakin’ fascinating! So anyway, I was able to put the book down (and frequently had to). This book sees the two of them (Jamie and Claire) off to France, where Jamie assists his relative by overseeing his lucrative wine business, all the while, integrating himself into Prince Charles’s “posse”, with the intention of possibly changing the course of history. The proposal was simple; His Majesty King James would provide travel expenses and a small stipend, if the nephew of his most loyal and most esteemed friend Alexander would agree to travel to Paris, there to assist his son, His Highness Prince Charles Edward, in whatever ways the latter might require. I was stunned. We had meant originally to go to Rome because that seemed the best place to embark on our quest: the prevention of the second Jacobite Rising – the ’45. From my own knowledge of history, I knew that the Rising, financed from France and carried out by Charles Edward Stuart, would go much farther than had his father’s attempt in 1715 – but not nearly far enough. If matters progressed as I thought they would, then the troops under Bonnie Prince Charlie would meet with disastrous defeat at Culloden in 1746, and the people of the Highlands would suffer the repercussions of defeat for two centuries thereafter. Now in 1744, apparently Charles himself was just beginning to search for support in France. Where better to stop a rebellion, than at the side of its leader? *phew* That’s a mouth full! And that’s pretty much the *gist* of it…(well, anyway, the “gist” of their plan to integrate and possibly steer history into a whole new direction). See though? These royals have the longest names, and crazy “nicknames” to boot, and after reading one name after the next, and one “generational association” to the next, they all started sounding the same. I kept having to gear myself up for yet another plot, another expedition, another battle, and another dangerous situation. Despite that, this book will keep you on edge with the many close calls that put Jamie and Claire in extreme danger. Anyone and everyone is a potential enemy and considering Jamie and Claire’s true intentions with their attempt to actually change history, they have the most to fear. ROAR!!!! (oooooh THAT MAN!!! There is a moment that had me quite livid, but it wholeheartedly addicted me to this couple). I swear I was shaking, and snapped at my husband when he made the mistake of speaking to me while I was reading that part. Was it what it seemed? Hrmmm….? So while I’d say that the very pertinent historical references could possibly bore you just a bit, there are so many other parts of the story that will keep you reading, and it will finally all come together for you. I eventually “got” it, perfectly. At times, while I was reading this book, I wondered if I’d be interested enough in the series to continue straight into book #3. By the end of this book, there was no question. I HAD to continue. You were right, Jennifer 😉 I’m only 30% into book#3, and it’s definitely a “stay up all night and read”. WOW!!! Love this review! Again I am behind you in it…but wow, this was an amazing sum. Thanks for sharing your thoughts. 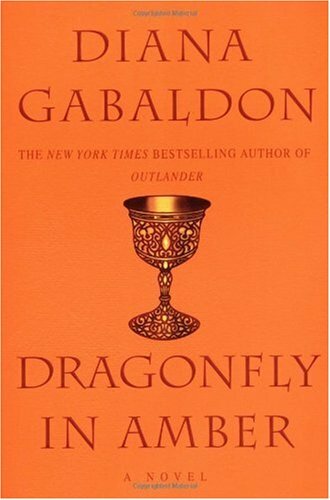 I am only about one third of the way done with “The Dragonfly in Amber” and am already planning a trip to Scotland. I am researching clans and the way folks lived. I guess you could say, I am obsessed too! Jamie reminds so much of my own husband. I just looked at the drawing of him on Diana’s website and fainted. It’s my husband!!!!!!!!! Maybe I will start writing about reincarnation!?!? !